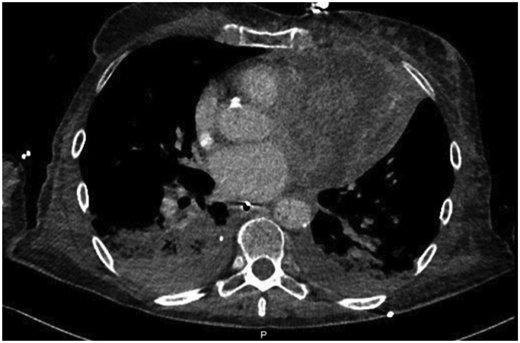 A 74-year-old woman with past medical history of left breast cancer submitted to radical mastectomy 10 years ago was admitted to the emergency department for acute dyspnoea. Clinical observation showed tachycardia, blood pressure 89/54 mmHg, regular heart sounds, no heart murmurs, arterial oxygen saturation of 85%, tachypnoea, accessory respiratory muscles use, and bilateral rales with left hemithorax dullness at percussion. Electrocardiogram showed sinus tachycardia, right bundle brunch block, and left anterior hemiblock with 2 mm ST-elevation in leads aVL, aVR, and I. Clinical condition deteriorated requiring intensive care unit admission, inotropic and vasopressor support, and mechanical ventilation. 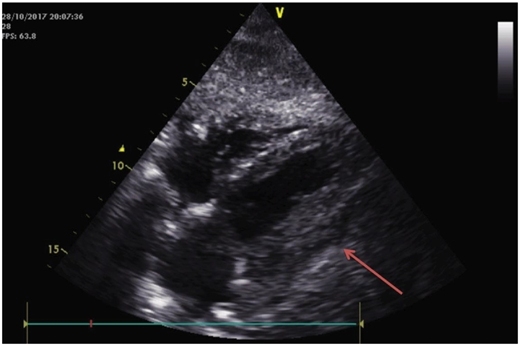 Bedside transthoracic echocardiogram (TTE) showed impaired LV function with anterior and lateral wall akinesia. A presumptive diagnosis of myocardial infarction (MI) presenting as cardiogenic shock was made and antithrombotic therapy including loading doses of aspirin (250 mg), ticagrelor (180 mg), and heparin (5000 UI) were administered. 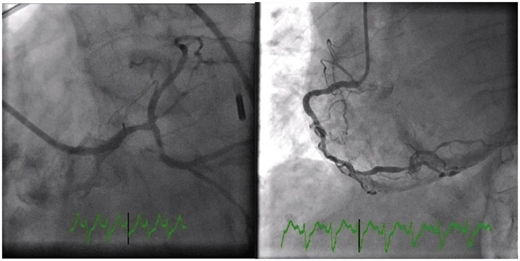 Emergent coronary angiogram was performed and showed diffuse non-significative three-vessels disease. Cardiac biomarkers were elevated (high sensitivity troponin I 32 ng/mL, for a normal &lt;0.07 ng/mL and BNP 528 pg/mL, for a normal &lt;100 pg/mL). Based on radiological chest imaging, a mass in the left lung was suspected; TTE imaging review showed LV lateral and anterior wall akinesis due to infiltration by a heterogeneous echogenic mass. Transoesophageal echocardiogram confirmed TTE findings, showing mild mitral regurgitation and a large mass invading the lateral LV wall. An urgent computed tomography (CT) scan was performed showing a neoformation located in the lower and mid sections of the left hemithorax, invading the lateral LV wall, pulmonary artery left branch, left pulmonary bronchi and anterior thoracic wall, compatible with an advanced lung cancer. 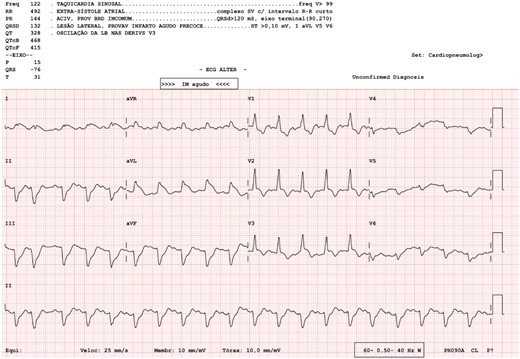 Despite supportive care, clinical status worsened and the patient died in the following hours.